How Does The Renfe Spain Pass Work? The Renfe Spain Pass is a travel document that entitles you to travel on Spanish trains, for a specific number of days. This particular pass is only valid for non-residents in Spain. In addition to this, it is strictly personal, non-transferable. Therefore, you need to carry your passport with you any time you want to use it. Your Renfe Spain Pass allows 4, 6, 8, 10 or 12 journeys on either Tourist or Preferente (Business) class. The trips are valid for all Renfe trains excluding sleepers. This means that you can travel on AVE, Long Distance (Altaria, Alaris, …) and Medium Distance trains. You can also use the Combinado Cercanías up to 3 hours before and after your trip. So you don’t need to purchase an extra Cercanías train ticket! The pass is active for six months as from the date of issue and is valid for one month as from the date on which it is first validated for a trip. Remember to always carry on your Renfe Spain Pass and reservation printed. You will be fined if you don’t show the proper documents when required. To travel you must book a seat. This booking is free of charges. You can easily purchase your Renfe Spain Pass online. The pass can be cancelled within 24 hours of purchase with no additional charge. You are entitled to a full refund. After 24 hours, and prior to using it for the first time, a 15% cancellation charge applies. After your first trip with the pass, you won’t get any refund whatsoever. If you have a Business class pass and you travel on Tourist class by mistake, you won’t receive any compensation. Pay attention when your book your seat! Tickets can be cancelled free of charge upon request at renfe.com, at train stations and at authorized travel agencies. Once a ticket is cancelled, the number of remaining journeys will be updated, restoring the non-used trip on the pass. Do I need to make seat reservations to travel with the Renfe Spain Pass? Yes, reservations are mandatory for each train journey taken with the Renfe Spain Pass. Rail Europe can book seat reservations for you or reservations can be made at a train station in Spain. Yes, a reservation can be canceled at a train station in Spain up to 15 minutes before the train is scheduled to leave the station. Once a reservation is canceled, the canceled segment is restored to the pass for future use. What if I board a train without a reservation? If you board a train without a previously issued reservation, you are considered to be traveling without a train ticket and will be charged the established ticket price. Renfe considers a travel segment to be any time you get on and then get off a train regardless of length of the journey. Can I use this pass to travel on an overnight train? No, the Renfe Spain Pass is not valid on overnight trains. What Is The Difference Between The Renfe Spain Pass And The Eurail Spain Pass? The Renfe Spain Pass covers the same trains as a Eurail Spain Pass does, except for overnight trains. 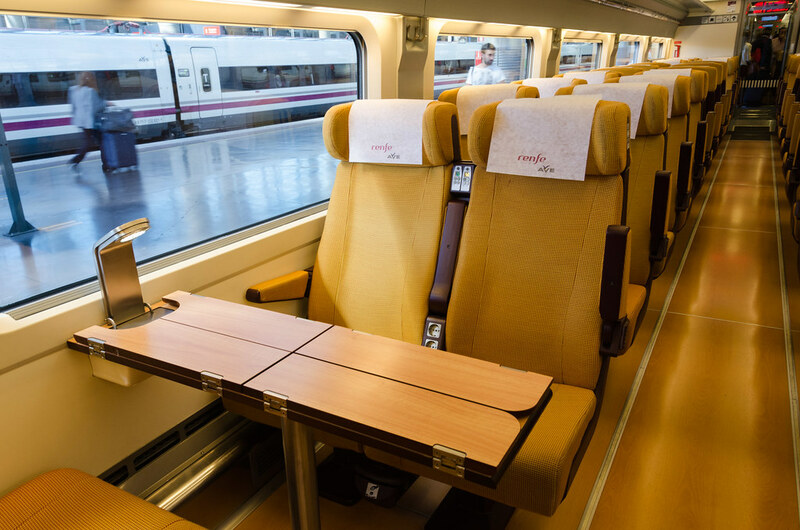 Unlike most of other rail passes including the Eurail Spain Pass, the Renfe Spain Pass is electronic (you will receive an email at the time of purchase with a link to print the pass), and reservations are included in the cost of the pass. Considering that reservations are a supplementary cost to the Eurail Spain Pass, the Renfe Spain Pass often works out to be the most economical option for multiple train travels in Spain. Also, since the Renfe Spain Pass is issued as an electronic pass, you can purchase it even though you are already in Spain. Alternatively, you can purchase your Renfe Spain Pass online as well. In contrast, a Eurail Spain Pass is a physical document that has to be shipped to you. The Renfe Spain Pass is also distinguishable from other train passes in that you purchase for “segments”, as opposed to “travel days”. A segment refers to each individual train you would be taking (i.e. “6 segments in 1 month” = 6 different trains in 1 month). Assuming you take direct trains for each of the trips you mentioned, that would equal 5 segments. However, there is no 5 segment of the Renfe Spain Pass. Therefore, for the above example, you would purchase the Renfe Spain Pass for “6 segments in 1 month”.